WASHINGTON— The Center for Biological Diversity petitioned the U.S. Fish and Wildlife Service today to designate critical habitat for nine endangered species that are among more than 600 federally protected species illegally denied specific habitat protections since 1978. The nine species, found from Maine to North Carolina and west to Illinois, include the roseate tern, Shenandoah salamander, Roanoke logperch, Hay’s spring amphipod, two tiger beetle species and three species of freshwater mussels. The petition requests that the Service designate as much as 3.2 million acres for the nine species, all of which continue to suffer substantial declines related to loss of habitat. Map of critical habitats by Curt Bradley, Center for Biological Diversity. Click on the map to view a PDF. Photos of species are available for media use. The Service’s failure to designate critical habitat for more than 600 federally protected species is in direct violation of the Endangered Species Act and several court rulings upholding that all endangered species should receive designated areas of protected habitat. Today’s petition seeks critical habitat protection for just a fraction of these, focusing on nine species in dire need of habitat-based protections to survive. Overall these nine species have been waiting for critical habitat for an average of 25 years. The Endangered Species Act prohibits federal agencies from adversely modifying critical habitat in actions they fund, permit or carry out and requires conservation measures to mitigate actions that might harm those habitats. All nine of the species are declining because of threats to their habitat — threats that may have been addressed had critical habitat been designated earlier. 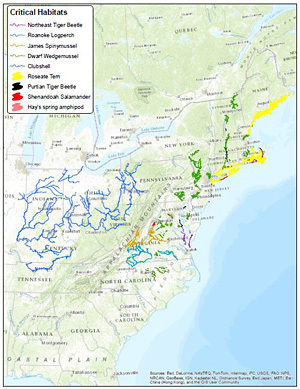 For example, in 2014, more than 39,000 tons of coal ash spilled into the Dan River in North Carolina, contaminating over 70 miles of river habitat, including habitat for two of the species included in the petition, the Roanoke logperch and James spinymussel. The loss of this habitat makes the remaining habitat for these two species all the more important. The Hay’s spring amphipod is Washington, D.C.’s only endangered species and is one of the most critically endangered animals in the United States. The amphipod only lives in a few small springs in Rock Creek Park, which is completely surrounded by urban development. The hydrological dynamics that create these springs can easily be altered by even the simplest careless activities. Paving over a small part of the any remaining watersheds that feed these springs could easily destroy or degrade them. The Roanoke logperch is a tiny fish that lives in a few river systems in Virginia. They are visual predators and hunt for prey by flipping over small pebbles at the bottom of rivers and streams with their snouts to find tiny invertebrates to eat. Logperch require clear, unpolluted water in unaltered river systems to survive. The Shenandoah salamander is an exclusively terrestrial salamander found on three mountain ridges within Shenandoah National Park. The salamander requires very specific habitat conditions — cool and moist montane forests above 2,600 feet — that unfortunately overlap with some of the highest-use areas of the park. As a result the Shenandoah salamander is under increasing threats from the spread of invasive species, pollution, human activities as well as climate change. The roseate tern is a beautiful seabird — breeding adults often have a pinkish-rose color wash on their undersides, a trait that made the tern a target of the millinery trade in the early 1900s. After protection under both the Migratory Bird Treaty Act and Endangered Species Act, the seabird rebounded significantly, but its population has fallen by 1,000 breeding pairs mainly due to continued habitat based threats. The James spinymussel, dwarf wedgemussel, and clubshell are three species of freshwater mussels for which the Center is seeking critical habitat in this petition. Freshwater mussels are one of the most endangered group of animals in the United States, with over 88 species protected by the Endangered Species Act, and their broad decline is an indicator of degraded water quality throughout the country. The dwarf wedgemussel was once found in rivers all along the eastern seaboard, and the clubshell was once abundant in the Ohio River valley system, so much so that they were an important food source to native American tribes across the East. Freshwater mussels can live for more than 100 years and have very complex life cycles.